The Director, Operational Test & Evaluation (DOT&E) is the principal staff assistant and senior advisor to the Secretary of Defense on operational test and evaluation (OT&E) in the Department of Defense. DOT&E is responsible for issuing DoD OT&E policy and procedures; reviewing and analyzing the results of OT&E conducted for each major DoD acquisition program; providing independent assessments to SecDef, the Under Secretary of Defense for Acquisition, Technology and Logistics (USD(AT&L)), and Congress making budgetary and financial recommendations to the SecDef regarding OT&E; and oversight to ensure OT&E for major DoD acquisition programs is adequate to confirm operational effectiveness and suitability of the defense system in combat use. 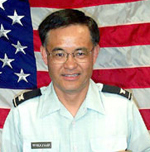 U.S. Army Col. J. Edgar Wakayama was awarded the Army's highest decoration for noncombat valor for repeatedly entering the Pentagon on September 11 2001 to search for injured people and leading several to safety before smoke and heat drove him out. He then began treating the wounded. Says Wakayama: Army medics don't leave wounded soldiers behind. Most articles posted at dU101.org are downloadable in the PDF format. Need it? Click below - it's fast and free!